Blowin' in the Wind: Pacific Northwest National Laboratory is commissioning two of these large buoys, which are decked out with advanced scientific instruments to more accurately predict offshore wind's power-producing potential. 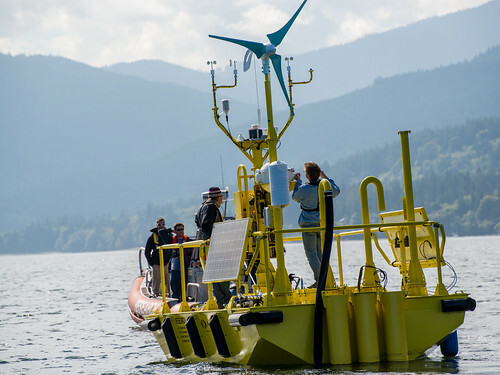 Research on the High Seas: Pacific Northwest National Laboratory staff conduct tests in Sequim Bay, Washington, while aboard one of two new research buoys being commissioned to more accurately predict offshore wind's power-producing potential. 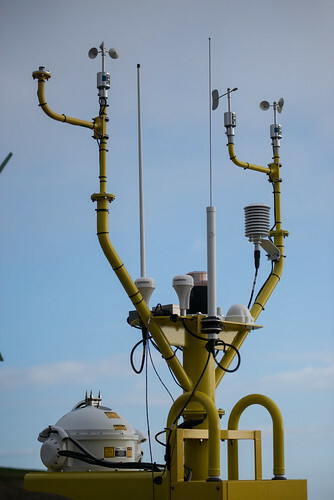 Instruments of Success: Meteorological instruments aboard the offshore wind power research buoys PNNL is commissioning include anemometers (small white spinning cups on towers) and lidar (large white ball at bottom), among many others. These instruments will provide data that will help improve offshore turbine performance and reduce barriers to investment in large-scale offshore wind energy development. SEQUIM, Wash. — Two massive, 20,000-pound buoys decked out with the latest in meteorological and oceanographic equipment will enable more accurate predictions of the power-producing potential of winds that blow off U.S. shores. 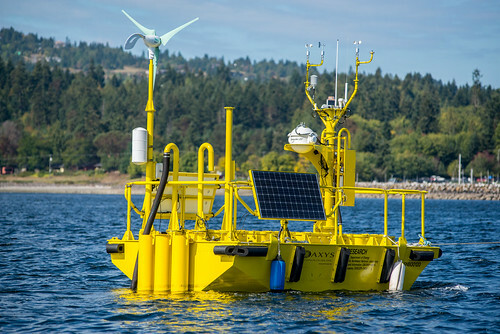 The bright yellow buoys — each worth $1.3 million — are being commissioned by the Department of Energy's Pacific Northwest National Laboratory in Washington state's Sequim Bay. Starting in November, they will be deployed for up to a year at two offshore wind demonstration projects: one near Coos Bay, Oregon, and another near Virginia Beach, Virginia. "We know offshore winds are powerful, but these buoys will allow us to better understand exactly how strong they really are at the heights of wind turbines," said PNNL atmospheric scientist Will Shaw. "Data provided by the buoys will give us a much clearer picture of how much power can be generated at specific sites along the American coastline — and enable us to generate that clean, renewable power sooner." Offshore wind is a new frontier for U.S. renewable energy developers. There's tremendous power-producing potential, but limited information is available about ocean-based wind resources. DOE's Office of Energy Efficiency & Renewable Energy purchased the buoys to improve offshore turbine performance in the near term and reduce barriers to private investment in large-scale offshore wind energy development in the long term. The buoys were manufactured by AXYS Technologies, Inc., in Sidney, British Columbia. A recent report estimated the U.S. could power nearly 17 million homes by generating more than 54 gigawatts of offshore wind energy, but more information is needed. Instruments have long been sent out to sea to measure winds on the ocean's surface, but the blade tips of offshore wind turbines can reach up to 600 feet above the surface, where winds can behave very differently. The buoys carry a bevy of advanced instruments, including devices called lidar, which is short for light detection and ranging, to measure wind speed and direction at multiple heights above the ocean. Other onboard instruments will record air and sea surface temperature, barometric pressure, relative humidity, wave height and period, and water conductivity. Subsurface ocean currents will also be measured with acoustic Doppler sensors. All of these measurements will help scientists and developers better understand air-sea interactions and their impact on how much wind energy a turbine could capture at particular offshore sites. The data will also help validate the wind predictions derived from computer models, which have thus far relied on extremely limited real-world information. PNNL is operating and managing the buoys for DOE. Researchers working from PNNL's Marine Sciences Laboratory in Sequim, Washington, will conduct initial tests on the custom-made buoys in Sequim Bay and near the Dungeness Spit along the Strait of Juan de Fuca, a channel of water between Washington state's Olympic Peninsula and British Columbia's Vancouver island. May 20, 2015 UPDATE: One buoy was deployed offshore of Virginia Beach, Virginia, in December 2014. The second buoy, originally slated to be anchored near Coos Bay, Oregon, will now be deployed offshore of Atlantic City, New Jersey, near the site of another proposed offshore wind farm. The date of the second buoy's deployment has yet to be determined.